Home Uncategorized	Lead Star of Jurassic World would like to visit Pakistan. Lead Star of Jurassic World would like to visit Pakistan. Jurassic world star shows his love and connection to Pakistan. 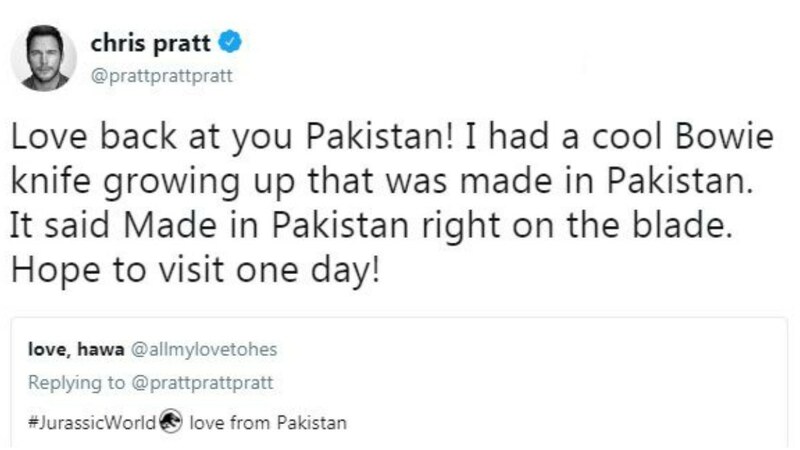 When Pakistani fan shows his love to Hollywood star “Chris Pratt”. Star said Pakistani loves Jurassic Park a lot that he got his love back…. He twitted and said he did like to visit Pakistan one day. Chris also added his connection to Pakistan and said that once he has a hunted knife written on its blade “made in Pakistan”. As so many people visited Pakistan but once they visited they wish to be visited again and again, they will never forget the love given by people, their hospitality, their warm welcome has always been unforgettable. Pakistanis always open their heart for giving love weather people from the country or outside of the country. You may be gone but you never be forgotten!